Filmed and edited by Shylah Soares. After defeating Long Beach State in overtime thanks to Christian Terrell’s game winning lay-in, the FGCU men’s basketball team defeated NAIA side Ave Maria 120-60 on Tuesday night. The Eagles’ 120 points is the most points scored in FGCU’s Division I era, breaking the previous record of 111 points in their triple overtime victory over Stetson in 2011. An interesting subplot in the Eagles’ victory over Ave Maria was Tejai Allen’s return to Alico Arena. Allen, a former walk-on at FGCU, transferred to Ave Maria and leads the Gyrenes in scoring. Allen seemed a man on a mission throughout the entire game, calling for isolation plays by keeping the ball in his hand and heaving the ball up on contested jumpers, as he looked to prove a point against his former teammates and coaches. Allen finished the game with 12 points on 3-17 shooting and 5-6 shooting from the charity stripe. 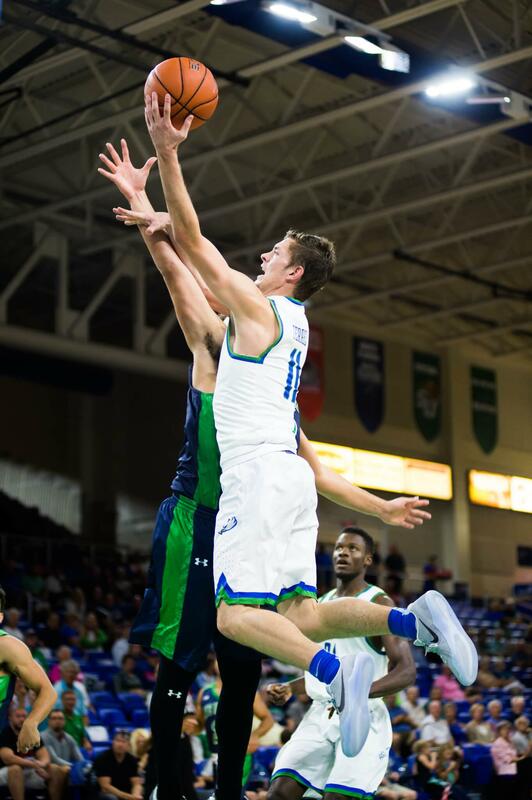 Starting guard Zach Johnson didn’t play for FGCU in its win over Ave Maria, as he was resting a sore foot. Combining for a total of 62 points, the Eagles were led by Brandon Goodwin, Christian Terrell, Demetris Morant and Rayjon Tucker en route to their 60-point victory. Throwing down four dunks in the Eagles’ victory over Ave Maria, Demetris Morant matched his career-high in points with 14 while sending four Gyrenes packing with four blocks. The Eagles outrebounded the Gyrenes 45-27 while shooting 67.1 percent from the clip and 52.4 percent from long-range. FGCU turned its consistent play on offense into defense, forcing 20 turnovers and limiting the Gyrenes to 31.7 percent from the field and 25.8 from long-range. Once FGCU took a 3-0 lead at the 19:33 mark, the Eagles never trailed in the match, keeping their foot on the gas on offense against an unmatched Ave Maria side. Starting the game on a 16-0 run thanks to five points early on by Goodwin, the Eagles held the Gyrenes scoreless for the first four minutes of play before a three-pointer from Romello Bates put Ave Maria on the board. Knocking down seven shots from behind the arc, the Eagles rode 14 first-half points by Goodwin and eight points on 4-4 shooting from Morant en route to 68.8 percent shooting from the field and 58.3 percent shooting from long-range as they headed into the break, up 53-20 at the half. Opening the Eagles’ second half account with a floater and the foul, Goodwin’s three-point play sparked the Eagles’ consistent aggressive play on offense. FGCU hit 75 points in the 16:02 mark of the second half, after going on a 10-3 run to push its lead to 75-31. With Dooley resting most of his starters in the last 10 minutes of action, Kevin Mickle led the way for the second unit, scoring 11 points on 5-9 shooting. Up 107-54 with 3:42 left to play, FGCU’s four walk-ons entered the game, as Maxx Bleecher led all walk-ons in scoring with seven points on 3-3 shooting from the field while knocking down the triple that broke the Eagles’ DI program record for points scored in a game. Riding points from 11 different scorers to their 120-60 victory over Ave Maria, the Eagles completed their three-game home stand unbeaten, as they head to Georgia to face Georgia Southern at 3 p.m. Sunday, Dec. 4.